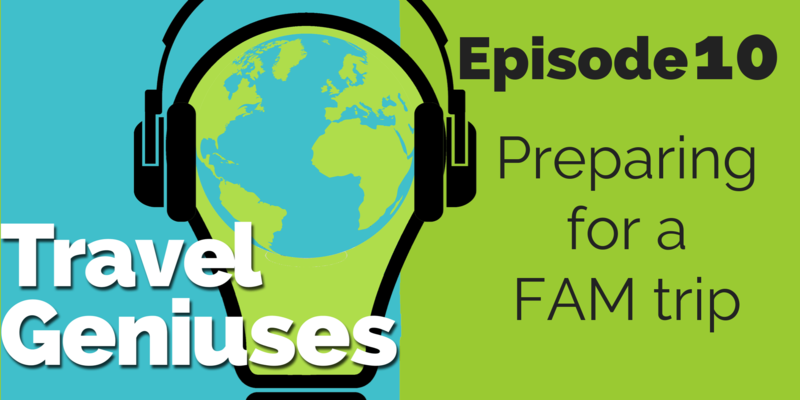 In this episode, we talk about everyone’s favorite travel agent perk – FAM trips!! But I’m not sharing tips on how to find and get invited on FAM trips. I’m sharing several things you can do before you leave to make sure that you come home from these trips with TONS of great photos, stories, and tips that you can share on your website and social media accounts. Jessie is a mom and self-taught photographer. She offers courses for smartphones, AND those big, fancy, DSLRs. Just like Becky Higgins, Jessie is teaching with the mom in mind, but again, these techniques can all be used when you’re traveling. One great thing Jessie teaches is how to take self-portraits and family photographs, so you can get great shots of yourself on location, even if you’re traveling alone and can’t hire a fancy photographer. You have to buy the complete course (with phone and DSLR tips) to get this, but it’s so worth it, you guys! She does also sell some presets for the free version of Lightroom, so if you don’t want to mess with trying to get your photos edited, you can just use one of her presets to get a great photo every time. Today we’re talking about FAM trips. But I am not talking about how to get on a FAM trip, or how to get free travel, or anything like that because I think it’s terrible. It’s one of my pet peeves when people promote free or cheaper travel as a perk of being a travel agent. It is true that we sometimes do get those perks, but it’s not as common as people think and it’s definitely not a reason to get into the industry. You have to work and be selling travel in order to get offered those opportunities and often it’s not a vacation. It’s actually traveling with a bunch of other travel agents,. It’s not worth it. just to get into it for the “free” travel. Which, we know, none of us really get free travel. Today I’m talking about how to use those FAM trips, and the travel that you do on your own, to promote the destinations and experiences your travelers want, and to get more bookings and to encourage them and inspire them to go on trips that maybe they wouldn’t have considered before. The first thing you need to do is make sure you’re choosing trips that you can market to your travelers, so you want to make sure you’re going to places that they would be interested in and choosing experiences and hotels or cruise lines if you’re going on a cruise that you want to sell and that they want to go on. So if you have really high end clientele that loves Crystal, you wouldn’t want to go on a mass market cruise and promote that because you’re just wasting your time. They’re not interested. It’s not something you want to promote to them. So just be really mindful when you’re choosing what trips to go on, if you’re looking for something to promote, make sure it’s something that fits your audience. Now every single trip you go on does not have to be something your audience is interested in. If they’re interested in different things than you are, it’s totally okay to go on a trip that you want to go on just for yourself. But I would really encourage you to at least once a year, if you can only afford one trip a year, have it be something that you can come home and promote to your clients. This is where you’re getting a lot of your firsthand knowledge so that when they have questions, you can speak to it as somebody who’s been there and done that. There are a lot of things you’ll see as you travel more that you just can’t pick up by reading a guidebook or watching a video on youtube. You really have to be there to understand what it’s like when you first get off the plane and there are hundreds of people with signs trying to get you to take their taxi to your hotel. And why it’s important to have a private guide and driver standing there with your name on a sign sometimes. Some of those things you really don’t know and can’t explain to your clients or prepare them for if you haven’t been there. So it’s good to have firsthand knowledge of the things you’re selling. And it also helps fill up your content vault or your stories and pictures and videos that you can use on social media or on your blog post or whatever type of content creation you use. So that’s where a lot of this comes from. You can sometimes get things from other sources, but it’s always best if it’s coming right from you. So that’s the purpose of these. That’s why I think you should do at least one a year. And please do not use FAM trips for your own personal travel. If you’re doing something on a FAM that you know your audience is not interested in, please don’t do that. This does cost the suppliers money and the reason they do it is a form of promotion for them too. So we don’t want to take advantage of that if you want to go on a family vacation somewhere or do something that wouldn’t necessarily fit for your brand, just pay for that out of your own pocket and don’t use up space that another agent could use that could benefit that supplier in some way. So just a couple of tips there. So tip number one is to make sure you’re choosing destinations and experiences that you can promote and that your audience or your clients would be interested in. Now, after you’ve got that all sorted out and have your trip planned, the next thing I want you to do is reach out to a few hotels. Hopefully you’re able to stay at a hotel that you would actually put your clients in. I tend to check out several hotels. My poor husband… We went to Hawaii for seven nights one time and I made him stay at five different hotels because I wanted to check them out. I’ve since changed my ways a little bit. We still do a little bit of hotel hopping. But I find that it’s better if you can stay at least two nights in a hotel and this is especially true if it’s a big resort like in Hawaii or someplace like that because you really don’t get to experience the hotel or the resort if you’re only there for one day. You’re getting there, you’re checking in at say three in the afternoon, so it’s time to get in and get settled, go have dinner, go to bed. And then you get up the next morning and you have to rush and pack and get checked out before 10 typically. So you never really get to relax and settle into the resort or experience a lot of the amenities that way. So I like to stay now at least 2 nights in a hotel. If I’m staying, say a week in one location, I will sometimes move around, and stay at two or three different hotels. But when at all possible, I like to stay at least two nights in a hotel. So you’ve got your hotel stays sorted out, then you can reach out to some other hotels in the area and if you’re not able to stay there, see if you can get a tour. They’re almost always really accommodating and really helpful when you want to do this and more than willing to, as long as they’re not overbooked and understaffed. Even if they’re fully booked, sometimes they can’t necessarily show you a room, but they’ll show you around some of the other amenities, the restaurants and things that the hotel has to offer. So always reach out to hotels in the area that you would also send guests who or have sent guests to. But don’t try to arrange this for every single hotel in the city. I have been on FAM trips before where they took us to four or five different hotels in a single day and I could never remember which one had which rooms and what I liked about the different ones. They just all blended together. We were always so exhausted by the end of the day. There was no benefit to it at all. So I would recommend not doing more than two additional hotels. And the way I like to do it now… I’ve always struggled with… They want a time, they want to know what time you’re coming so that they can have somebody there and things are all set up. They do a lot of prep work for this, they find out which rooms are available and they’ll get keys set up for them and all of that. So there is some work on their part. So first of all make sure you show up and show up when you’re supposed to. But I always struggle to pick a time because I didn’t know what the rest of my day was going to look like at that point. So what I like to do now is pick one day and have one in the morning and one around noon. So one will be late morning. I’m not showing up at six in the morning. I’m sleeping then, but pick one sort of late in the morning, and one around noon or early afternoon. And just have those two things be the main activities for the day. And then the rest of my trip can be more relaxed. Another way to do this would be to just book two of them in the morning, so one on one morning, one on the second morning. I tend to like to do this at the beginning of the trip so that I have someplace to go and it helps me get a bit of a feel for getting around the city and I’m not just wandering around aimlessly. I kind of get a feel for the vibe and I’m a little more comfortable the next day going out on my own and exploring. So that’s how I like to do it when it’s a land trip. Now you can do this with a cruise as well. I travel with a friend of mine a lot and we will look at each port and see if there are any of our preferred hotels there. And then we reach out to the hotels to see if we can pop in for a quick visit and a tour. And they’re almost always accommodating. They are thrilled to have us there. But if you’re doing it with a cruise, I would only pick one hotel because sometimes your time in port is really short, so there’s not a lot of time to get to the hotel and back. Some of the hotels are kind of remote, so just pick one hotel per port if there is more than one. See which ports have hotels that are preferred hotels for your niche, and see if you can pop in for a visit instead of going on a traditional tour. So now we’ve got our trip booked and planned. We’ve got our hotel situation sorted out. We’ve arranged a couple of hotel tours. Now it’s time to do some research for your customers and your niche. You want to think about what kind of food they like. Do they like fancy food and five star dinners? Or are they more interested in eating with the locals and having some type of mom and pop restaurant experience. Do they need kids activities? What is there to do in that town or city for kids? Do they like shopping? Do they like local handicraft shopping? Or are they interested in more luxury goods and things like that,. I’s important to think about what they want and how they travel, and plan to experience a few of those things. You don’t have to experience everything, but it’s really important for instance, if they’re traveling with kids, say you are in China and you typically book family travel. Kids can sometimes be picky eaters, so it’s important to find restaurants that will cater to kids who just want French fries and chicken fingers every night for dinner. So just be mindful of those kinds of things when you’re planning your day and what to do even if it’s not typically what you would do if you don’t have young kids that you travel with anymore. Make sure you check out a few of those things. Now, a few places you can go to do the research would be TripAdvisor. Check out some guide books from the library, look up reviews for the hotels you’re visiting and also reach out to the tourist board and the hotels that you’re visiting too – the concierge there or your sales reps. My husband and I, we like to eat more local. You kow the Diners, Ddrive Ins and Dives show? We like those restaurants, typically, that kind of food. I like a fancy meal too, but when I’m traveling with my husband, we just like to find these little out of the way hole in the wall places that hardly anybody’s ever heard of, but all the locals love. So you can even ask a shop girl, you know, we’ve asked people working in souvenir shops before. I’ve asked people working at the hotel… But just ask for recommendations for their favorite places to eat and things to do. That’s how you find stuff that’s not necessarily in the guidebooks or isn’t necessarily found in a google search plan. Those types of things out before you leave and make sure you have some places to go. Obviously before you leave, you can’t ask somebody working in the t shirt shop, but you can reach out to the hotel you’re going to be staying in or visiting, and get their recommendations for places you should check out. Now, if you’re going on a cruise or staying at a nicer hotel, look for interesting things about the ship or the property that you can highlight as well. Is there somebody you can interview? Is there something special that they do that you can talk to somebody about and get some sort of behind the scenes access to something that your clients might be interested in. For instance, I was on a Seabourn cruise, and they had a Thomas Keller menu. He’s a really famous chef and so they had this menu that he had put together. I think there was a restaurant dedicated to him and then a few menu items each night that were his dishes that he had designed. We were talking to some of the staff and they had this process where they had to take a picture of each dish that went out. (you can’t quote this because I didn’t get a real quote. I was just chatting with somebody) They would take pictures of each dish that went out and send it off to him and he would look at them each night to make sure that things were going out and looked the way he wanted them to look. He didn’t do it as they were going out, but at the end of each night he would kind of review them and and help them make corrections if they needed to, if he saw things that weren’t done to his standards. So that’s really interesting fact that I could have used in a blog post or a social media post had I planned ahead and really was more mindful about paying attention to what people were saying and maybe taking some notes and getting pictures and things like that. So this is just my memory of a conversation and I can’t guarantee that that I remembering correctly. So anyway, look for things like that. Little interesting things that you could write a blog post about or write a social media post about and plan ahead when you get to the hotel or even before you get there and the cruise ship as well and see if there’s somebody you can talk to, or somebody who will take you behind the scenes to show you how things work. People really like that stuff and showing them how a destination, hotel, or a cruise ship makes the experience special, that makes it all the more… It’s the stories behind things that people are interested in. It’s not just seeing a picture of your fancy meal, it’s hearing how that came to be in that place you’re in. That really makes people, at least me, want to experience things more. One place to find this kind of thing, so that you know about it before you get there, is to read reviews. Now, this could be on TripAdvisor or on Cruise Critic or Trippy or someplace like that. Something where people are talking about their travels. Look for things that people are commenting on that they loved about the experience and that could be something that you want to make sure you seek out and get a little extra information and be prepared to capture that when you’re there. So keep an eye out for common things that people talk about that they loved about an experience, but also keep an eye out for complaints. I don’t want you to highlight the complaints or the bad things about an experience necessarily, but if there’s something that you see three or four people comment on that maybe wasn’t the best part of the experience, look for ways that you can minimize that for your clients. So if they’re talking about not enough outlets in the room, maybe send them with a little battery pack or a power strip. Not a whole strip, but, you know, a little thing that has an extra couple of outlets to it. Just keep an eye out for things like that and look for ways while you’re there that you can solve those problems for your clients when you send them there on a future trip. Okay. There’s one last thing I want you to do before you leave home. Now we’ve planned our trip out. We know where we’re staying, we know what we’re doing, we know some things we need to look out for and special experiences we want to check out so that we can tell our clients about them. Now, one last thing before you go, I want you to brush up on your photography skills. You don’t have to go out and get a big fancy camera. If you have one of those, that’s fine. I am trying more and more to only travel with my phone. Our phone cameras are much better than the cameras from even five years ago and I don’t like to draw attention to myself. I don’t like to be obnoxious with the camera in my face all the time and I don’t like carrying extra things with me and worrying about losing it or breaking it or it getting stolen or something. So I really, when at all possible, I like to just use my iphone. So when I say brush up on your photography skills, I’m not telling you you have to go out and enroll in a class at a college or invest in a lot of fancy equipment. Just use your phone. I’m going to link to some resources in the show notes. I was going to talk about some specific classes that you could take, but this may change, so I decided I’m just going to link to it in the show notes. So the show notes should have my current recommendations for any photography classes. I try to find ones that use your phone typically. I’ll try to find some resources for those of you with bigger cameras as well and you’ll be able to find all of those recommendations at travelgeniuses.com/episode10 But it doesn’t have to be anything fancy. I don’t want you thinking you have to be a professional photographer. More likely than not, your clients are going to be drawn to pictures that you’ve taken that don’t look like they’ve been taken by a professional because it makes them believe more that you’re just a normal person doing this, and that those pictures were really your experience versus a very corporate boring “here’s the perfect room shot”. It’s okay that it looks like it’s just you that took the picture. However, there are some tips on composition that can make a picture more interesting to look at some really easy ways to edit your pictures so that they draw attention more in a instagram feed and things to help you make sure your pictures are not blurry, that there are very clear and in focus because – don’t even post any pictures that are not in focus. I want you to brush up on some of those skills to make sure that you know how to work whatever camera you’re traveling with, whether it’s your phone or your big camera. Make sure you know how to use it before you go, and then practice just around your house with different angles and things that you’re learning in these classes too, so that when you’re out traveling, you’ll be able to capture the things that you want to capture in a way that is usable. Because nothing’s worse than coming home with a thousand pictures and having five that are even worth sharing. Now along those same lines, I want you to go out and actively look for pictures and videos online that you can use as inspiration of pictures that you want to take when you’re traveling. So what I’ve done before is go on instagram and I’ve looked up a hotel I was going to stay at it. Just look up the Hashtag. So hashtag is a little tag so that if you want to find pictures about a certain topic, they’re all in one spot. It’s sort of like putting them in a folder. So I stayed at a hotel called The Nines in Portland, Oregon. Really nice, fun hotel and I just did a quick search in instagram for the hashtag #thenines and found several pictures. They have this big open, square area, so the hallways on the upper floors are in a square and the whole inside the middle is open so you can lean over the balcony a little bit and take a picture right down the middle into their common area with the restaurant. They have this really large wood table. It’s like they took a massive log and made a table out of it. It’s just a really great shot and I wouldn’t have thought to get that if I wouldn’t have looked in that hashtag because somebody else had taken a similar picture. So that gave me the idea for that. I have a swipe file, and I’ll do an episode later kind of telling you how to gather all of these things and have a place for them. But somebody had a picture of the, the soft fluffy white comforter on their hotel bed and they had a picture of it on their bed, all messed up with this big fluffy blanket and then the window outside was in the background and I never would have, up until then, I always thought my pictures had to be of the room before I even touched it when I first walked in. But I loved the look of that room with the bed all messed up and it wasn’t dirty and gross. It was just like somebody just been in the bed and it was a really cool shot. So I’ve taken a few like that as well. So look on Instagram, look on Facebook, but just look for things – you can do a search. Sometimes people take pictures on TripAdvisor, but they’re not typically good pictures. I would just maybe do a google search and click on images to find images of a hotel or a destination. Look on Hashtags, look up cruise, Caribbean cruise or European cruise or #rivercrise cruise, whatever. But look for pictures of wherever you’re going and whatever you’re doing that might give you inspiration for pictures you can take yourself. I’m not telling you to steal these pictures, just use them as inspiration and maybe put in your calendar or something on the day you’re going to be in that place. Take this type of picture that’ll help you come home with pictures that you’re excited to use and if you’re not necessarily the most creative person and can’t come up with these ideas yourself, like me. I’m a very good copycat. I don’t steal, but I’m very good at gathering and gaining inspiration from other people’s work. So feel free to do that. Just don’t copy their work outright. Okay, so now we’ve done all this research and gone on our trip and came back with some really great pictures… what are you supposed to do with them next? Well, in the next episode I’m going to be interviewing Brianna Glenn from Milk and Honey Travel and she is probably my favorite travel agent as far as the way she uses her social media accounts. I follow her on Facebook. But I see more of her stuff on instagram and she just has this great way of letting you know that she’s a travel agent and that she wants your business but not making it feel salesy and still having it be something… I’m not going to be hiring her anytime soon, if ever, but I still look forward to her posts. So they’re still very interesting and I look forward to reading them, but she makes me want to use her as a travel agent as well. I don’t know how she does it. She is the one person that I am constantly referring people to to see how to do Instagram right. But I can’t really explain how she’s doing it, so I thought I’d just have her on the show and let her tell us herself. So make sure you check out that episode because I know it’s going to be really good. And that’s it for this episode. I hope you enjoyed it. If you try any of these tips out and it makes a difference in the kind of content you come home with and helps you use it better, please let me know. I always love hearing when you guys have gotten something out of the episodes. It helps motivate me to make more of this content. Now, one thing I do want to point you to is episode 3. I seem to mention, in every episode, the importance of having a niche. Before you do any of this stuff – if you are going on a trip to promote on social media, you need to know the needs of your niche. And to do that, you need to know what your niche is. You need to know who you’re serving and how you’re helping them. So I want to make sure that you guys take that first step and really hone in on your niche. So I’ve created a really great work book and actually recorded a whole episode about this topic. You can find that at travelgeniuses.com/episode3, and I’d really encourage you, if you haven’t listened yet and haven’t gone through the workbook, to go back and listen to that. I truly believe that that is the first step to building a business you love – making sure you know who you’re serving and how you’re helping them. It will change everything else in your business, so go ahead and check that out. It’s at travelgeniuses.com/episode3.